Ali is a member of the Corporate and the Commercial Real Estate practice groups at Owens Wright. 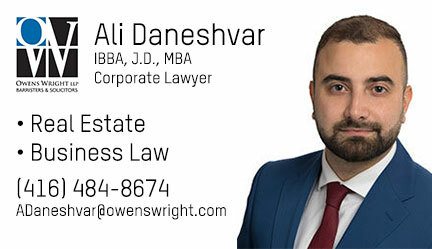 Ali summered and articled with Owens Wright and returned to the firm as an associate, after being admitted to the Ontario Bar in 2017. Ali completed his law degree at Osgoode Hall Law School, where he spent a summer studying at the Hebrew University of Jerusalem and completed a condensed program on Israeli and comparative legal perspectives in Public Law, Private Law and International Law. During his legal and business studies at York University, Ali helped shape and lead the Osgoode Venture Capital Clinic, a student-led initiative providing pro-bono legal services to Toronto start-ups. Ali has gained valuable expertise in the real estate sector as a Realtor and was active in the field of investor immigration as a business mobility consultant. Prior to his legal education, Ali completed a Bachelor of Business Administration at the Schulich School of business and gained valuable insight in marketing and strategic management while working at a Fortune 50 multinational corporation in Toronto and Montreal. Ali is fluent in French and Persian.